Check out our Sean John section for more posts about Sean John. Back in December of 2009, during a scheduled appearance on the Home Shopping Network, Diddy revealed to a caller that a female counterpart to Sean John's "I Am King" fragrance was in development and that it may be called "Empress." Fast forward 19 months and "Empress" has now been officially announced. According to Women's Wear Daily, care of The Scented Salamander, the new perfume will launch in August and will be available at Macy's stores. 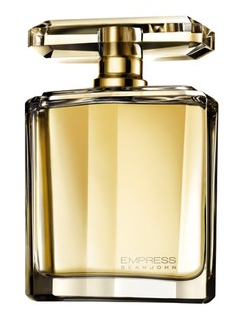 "'Empress' is a crisp floral perfume," writes Marie-Helene Wagner of The Scented Salamander. "It opens on notes of key lime pie, mandarin imperial, starfruit and imperial french berry before developing a heart resting on raspberries, passion flower, peony, cardamom and ambrette seeds. The scent lingers on with vanilla, sandalwood, crystallized caramel and second skin accord." It will be released in two sizes, a 1.7 oz. bottle for $57 and a 3.4 oz. bottle for $74. A 6.7 oz. body cream will also be available, for $38. What will be bottle look like? Check out the picture below.